The book entitled “Biodiversity of Pantepui: the Pristine Lost World of the Neotropical Guiana Highlands” (Eds., V. Rull, T. Vegas-Vilarrúbia, O. Huber and J.C. Señaris) has been finished and is now in production by Elsevier/Academic Press. Pre-orders with a 15% discount can be placed following this link. The expected date of release is July 1, 2019. Click here for a video of the unique Pantepui landscape. The book provides the most updated and comprehensive knowledge on the composition, origin and evolution of the biota of the Pantepui biogeographical province. It synthesizes historical information and recent discoveries, covering the main biogeographic patterns and evolutionary trends. Written by international experts on the biodiversity, biogeography, evolution and conservation of this pristine land, this book explores the environmental and biogeographical factors, along with the characteristics that make Pantepui a unique natural laboratory to study the origin and evolution of Neotropical biodiversity using only natural drivers. The book covers organisms living in Pantepui, including vascular plants, mosses, algae, aquatic insects, butterflies, land snails, scorpions, birds, amphibians, reptiles, and mammals, with later sections delving into the potential effects of global warming and current conservational efforts to combat these threats. This book will be an important resource for researchers, ecologists and conservationists who not only want to understand the biodiversity and history of this pristine land, but also help to help conserve and protect it from environmental and human damages. Rull, V., Vegas-Vilarrúbia, T., Huber, O. & Señaris, J.C. 2019. 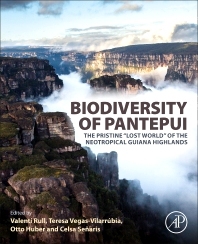 Biodiversity of Pantepui: the Pristine Lost World of the Neotropical Guiana Highlands. Elsevier/Academic Press, Cambridge. ISBN 9780128155912.